During National Bullying Prevention Month, Team Rainbow Rabbit is profiling bullying victims who have been able to rise above their troubles despite encountering many obstacles along the way. In the case of Ayden Sainez, he’s not only overcoming bullying, but open heart surgery as well. According to Ayden’s mom, Nelly Sainez, it started last October, when Ayden was beginning Kindergarten at his elementary school in Elementary School in Plainfield, Illinois. “It was in music class. He was kicked, bitten and his head was pushed into the concrete by several students,” she said. Nelly, as well as other bullied children’s parents from Ayden’s class, approached the school regarding several incidents, but nothing appeared to change. The reluctance of the other parents, however, didn’t stop Nelly from moving forward. “During the process of finding help, I contacted our local state representative and city’s mayor, but they all turned the cheek. They stated that this should be addressed by the school district. At times, I felt hopeless because so many chose to not hear my cry for help. All I want is to raise awareness on bullying and how it affects our children. Our children have the right to a safe learning environment. Luckily, Ayden was able to finish the school year without further incidents taking place. However, just as he hurdled one obstacle, another one was right around the corner. This past June, Ayden was diagnosed with a congenital heart defect. While coming to terms with his diagnosis, Ayden, with the help of Nelly, launched Ayden’s Fulfilling Your Birthday Wish— a Facebook page featuring Ayden helping others who are less fortunate while spreading an anti-bullying message. Despite the severe obstacles he was facing, Ayden never lost his desire to help others and treat them with kindness. Thankfully, Ayden’s condition was diagnosed in time, and he underwent successful surgery in August. Naturally, the Sainez family expressed concern that the bullying behavior previously shown by students in Ayden’s class would continue upon his return to school. For the most part, however, things have improved. “Overall, things are much better, Nelly said. “Prior to Ayden starting the school year, I wrote a letter for parents and the students. I asked the kids to be Ayden’s friend and lifesavers. It explained briefly that he had a heart condition and needed their assistance to help him stay healthy. We had a parent reach out and had her daughter stop by with a gift for Ayden before having heart surgery. She wanted to reassure him things will go great and that he had a friend in her. Ayden returned to school two weeks after his surgery. He is doing really well. It is yet to be determined whether Ayden is out of the woods yet in regards to the severe bullying he encountered last year. However, he has overcome so much that there is no doubt he will persevere, and Nelly Sainez will never give up the fight to secure her son’s safety—whether it involves school counselors, lawmakers, Congressmen or even and state senators. You can learn more about our Rainbow Rabbit Anti-Bullying/Kindness Programs here. nextWin An Educational Program For Your School From Rainbow Rabbit! Did you know that you can get The Rainbow Rabbit Anti-Bullying Program for School and Home? Rainbow Rabbit 'Color Me Kind' Coloring Sheet Now Available! 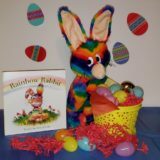 Easter 2019 Is Coming; Give Your Children the Gift of Rainbow Rabbit! Subscribe to our newsletter and follow the adventures of Rainbow Rabbit and his Anti-Bullying School Programs.